At a glorious 53, BBK DAV College for Women stands tall as a provider of Quality Higher Education on the national horizon. It was founded in the year 1967 under the aegis of DAV College Managing Committee, New Delhi, with the avowed aim of spreading the benefits of education to women, synchronizing tradition with modernity. A multi faculty institution, that aims to blend professional & vocational education with traditional courses, it is an excellent model of what a women’s college can do for women’s development. The thrust of the college is on the highly innovative and efficient management of all its resources – human and infrastructural. The history of fifty three years bears testimony to an unflagging commitment to provide the best combination of tradition, communication and vocational skills. The college combines teaching excellence with extensive sports and cultural opportunities. The academic thrust is on imparting in-depth knowledge of the subjects concerned and to develop critical abilities to enable the students to relate and use knowledge in real life situations. The co-academic and cultural activities are focused around inculcating a strong sense of obligation to nationalist, social & aesthetic values. Nurtured by an ideal amalgam of facilities and facilitators, the college scholars, sports persons and artists have been winning the highest honours in their fields of interest. In this session, the college scholars won 299 Merit positions, including 48 First, 55 Second, 29 Third & 167 other merit positions. 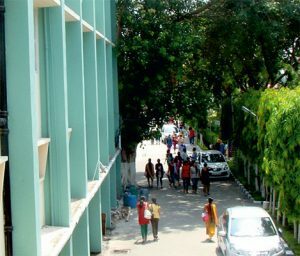 The college enjoys the rare honour of having given to the nation one Arjuna Awardee , one Olympian, one gold Medalist in Asian Games and scores of players of the international level in addition to 400 sports women of extra ordinary ability to meet the national standards during the last five years. In the session 2017-18, nine college players won name and fame at international level, vizly Aleena Reji, Cycling player got 4th position in Asia Cup held at Bangkok. She participated in Commonwealth Games held in Gold Coast (Australia). Nayana Rajesh. P, cycling player, won two Bronze Medals & secured Two 4th Positions in Track Asia Cup.She won two 4th positions in (500m time trail & team sprint Women Elite), Track Asia Cup held at Bangkok. She also participated in Track Asian Championship held in Malaysia. Amritha Reghunath. G, Cycling player, won Bronze Medal in Track Asia Cup and participated in Commonwealth Games held in Gold Coast (Australia). Vaishnavi Ghabhane and Sushikala Durgaprasad, both Cycling players, participated in Track Asia Cup. Neelam Bisht, Cricketer, won Second Position in Bangladesh Premier League held at Mirpur, Bangladesh. Priyanka, Mehak Khurana, Chess player, participated in Common Wealth Chess Championship. The investment of the college in sports is more than Rs.55 lacs per year and it provides the latest equipment for all the 49 games of GNDU. The college won 27 Championships, 7 runners-up positions and 9 second runners-up positions in the GNDU intercollege competitions for the session 2017-18. The college has made tremendous contribution to university sports, adding a major share in Guru Nanak Dev University’s exceptional feat of winning Maulana Abul Kalam Azad All India Trophy for Sports. The college won the Shaheed -E-Azam Bhagat Singh Overall General (men & women combined) Sports Championship trophy 2015-16 and Overall General Sports Championship trophy 2016-17 with cash prize of Rs.32,000 (thirty two thousand) and our players won a huge amount of Rs.20,000,00 (twenty lacs) on the 47th Annual Sports Prize Distribution Function 2016-17. In the session 2017-18, our players have been the proud members of the Indian contingent for the Asian Games and Commonwealth Games. Our players have bagged 2 Silver and 2 Bronze medals in Asia Cup and 2 participations at International level; 23 Gold, 36 Silver and 21 Bronze medals at National level and 24 Gold, 35 Silver and 52 Bronze medals at Intervarsity level. In all the fields of cultural activity, the college artists remain in the forefront. The college has been the proud winner of GNDU Zonal trophy for decades together, winning top honours at state and national level in a number of items. The college has been winning Championship Trophy as well as topmost positions for the last decade in GNDU Youth Festival. The college NCC and NSS units have been decorated with the highest honours. Our cadets have won the honour of commanding the NCC contingent at the Republic Day parade in New Delhi. In this session, our NCC Cadet Ritu Poria attended the prestigious All India National NCC Thal Sena Camp held at New Delhi. The college takes genuine pride in pursuing its community service programmes and extensive activities most vigorously. To broaden the students’ horizons, the college provides them abundant exposure through various seminars, guest lectures, exhibitions, excursions, student exchange programmes field visit & the like.